The Church Militant store calls this version of the Latin Vulgate “The official Bible of the Catholic Church”. That is false for a few reasons. First, the edition is question is called Weber-Gryson, after two of the editors: “Originally edited by Robert Weber in 1969 and revised for the fourth (1994) edition by Gryson.” But it is also called the Stuttgart edition. It was never used by the Catholic Church at Mass, nor in any official documents. It was never approved by the Catholic Church. At no time and in no sense was this edition “the official bible of the Catholic Church”. Second, the edition is the work of the German Bible Society in Stuttgart, which “which is made up of representatives of 23 regional Bible Societies, 14 Free Churches and Christian organisations, along with individuals.” [Wikipedia] Most of the organizations and members of the German Bible Society are Protestant. Some Catholics worked on the Weber-Gryson edition, but so did some Protestants. Third, the current official Latin Bible in the Church is the Nova Vulgata (ugh! ), which is essentially a Latin translation of the Hebrew and Greek texts. Fourth, the official Latin bible prior to the Nova was the Pope Sixtus V and Pope Clement VIII Vulgate, which developed over four editions: 1590, 92, 93, and 98. Subsequent editions over the next few hundred years were always light edits of the 1598 version, often called the Clementina Vulgata. The edition offered by Church Militant is most decidedly NOT the Clementine Vulgate, nor any light edit of it (such as the well-respected 1914 Hetzenauer edition. Thus, the official Latin Bible in the Church can be said to be either the Nova Vulgata, or the Clementine Vulgata. 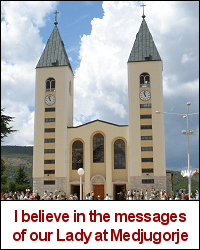 The edition offered by Church Militant is neither. Fifth, the Weber-Gryson edition eschews the Clementine Vulgate tradition. Roger Gryson, in particular, had a low opinion of the Clementine Vulgate, as he considered that the Clementine edition was not an accurate reflection of the Old Latin Vulgate (Vetus Latina). His Stuttgart edition, as sold by Church Militant, rejects what was the official Latin Bible in the Catholic Church for hundreds of years, and instead uses modernist Biblical principles to revise the text extensively. The Weber-Gryson edition can be recognized by its utter lack of punctuation, and by the typographical error of Genesis 3:20, in which Eve, in the Latin version of her name, is called “Hava” instead of “Heva”. That is the edition being sold by Church Militant, falsely claiming it to be the “official Bible of the Catholic Church”. Finally, the description at the Church Militant store says: “Recommended as a standard resource for biblical study.” If you are a devout conservative Catholic, with conservative views about the Bible, then it should not be recommended. It is the type of Latin Bible edit which represents liberal modern Biblical criticism, not traditional Catholic thought. 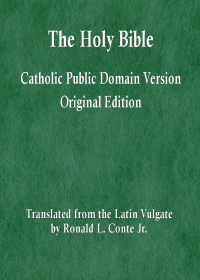 The Council of Trent approved the Latin Bible, and subsequently, the Church responded by producing the Pope Sixtus V and Pope Clement VIII Latin Vulgate. That edition is best for study by Catholics, not the Stuttgart (Weber-Gryson) edition by the mostly-Protestant German Bible Society. especially the Leander van Ess edition of 1822 which compares all four original Sixtus V and Clement VIII Vatican-approved editions of the Vulgate. Sorry, if you were hornswoggled by Church Militant and bought that edition of the Bible.